New Jersey automobile owners may disagree about which cars are faster, sleeker, or which perform the best, but one thing all drivers can agree on is this: When it comes to lapsed insurance, New Jersey laws are strict. Like most places, New Jersey has minimum insurance requirements, and it's not okay to drive without meeting those. Citizens of New Jersey do have insurance package options that make buying car insurance more affordable. Drivers can choose from minimum coverage or more comprehensive insurance policies. Purchasing minimum coverage is the more affordable option from month-to-month, but it includes fewer benefits and could end up being more expensive if you’re in an accident. There can be lots of details related to the reasons that car insurance is allowed to lapse, but for most people, the reasons can be broken down into one of about five different categories. The first is simply not having the funds available to pay for the insurance, and the second is forgetting to pay for the insurance. The third and fourth categories relate to the automobile being broken down or involved in an accident -- any situation under which it is no longer drivable for some time. And the last category relates to the vehicle being sold. Obviously, within each of these categories, there can be various reasons and circumstances. However, when it comes to car insurance, it is always best to never let the insurance lapse. If the lapse is due to oversight or because of lack of funds, there is a good chance that the vehicle is still being driven. This is not recommended. 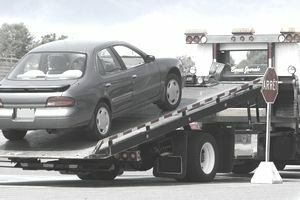 Even when a car is out of commission, it is not wise to allow the insurance to lapse. If you’ve forgotten to pay your insurance premiums, you should consider setting up auto pay with your bank – sometimes you’ll even get a discount for doing so. You could also set a monthly calendar reminder on your desktop computer and phone so that you’ll never miss a payment. Driving a motor vehicle without insurance is indulging in risky behavior. Very serious outcomes could result. In the end, as the owner or registrant of the vehicle, you could be held personally liable in an accident. Another concern is related to fines issued to uninsured drivers. Besides fines, other penalties may also be imposed. Also, this adds insurance points which make the cost of your insurance policy more expensive. It may seem that the driver of an uninsured vehicle would automatically be the person to receive any charges related to driving without insurance, but the reality is, the liability can also fall to the owner or registrant of the car. New Jersey law can impose the liability upon the registrant or owner if that person causes the vehicle to be operated. This refers to the owner or registrant of an uninsured motor vehicle allowing another driver to drive the automobile. However, if the driver is aware of the fact that there is not any insurance on the vehicle, that driver may also be liable. How Much Insurance Do New Jersey Drivers Need? Every motor vehicle should, according to New Jersey law, have at least a minimum amount of liability coverage. This provides coverage for such things as property damage, bodily injury, and even in the case of death. Minimum bodily injury and death coverage for any one person must be at least $15,000 and, at the minimum, $30,000 for a single accident. The insurance must include no less than $5,000 for property damage in a single crash. Of course, just because this is the minimum coverage doesn’t make it the recommended coverage. All drivers should consider purchasing more comprehensive car insurance policies if they can afford to do so – otherwise, they won’t be covered in a lot of scenarios, which could get expensive very quickly. New Jersey imposes severe and strict penalties on those who drive without insurance. Consequences can include fines, surcharges, suspended driver's licenses, and unpaid community service. Plus, insurance points are imposed, which can significantly add to the cost of car insurance. Car insurance is an absolute requirement for New Jersey residents. Don't take chances; keep things legal for you and safe for everyone concerned. Learn about the differences between the Basic Policy and the Standard Policy -- then decide which package will work best for your specific set of circumstances. Keep in mind that different insurance companies offer different prices, so taking the time to do online comparison shopping is always worthwhile. The bottom line is, New Jersey car insurance is indeed a necessity, but you do have options!